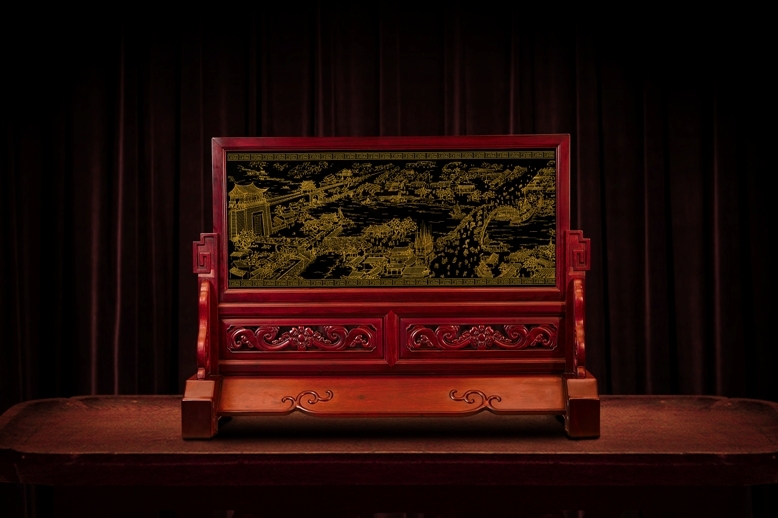 World Record Title: The "Riverside Scene at Qingming Festival" (part) gold inlaid with jade "wrong gold and silver" decoration created by Mr. Zhang Guowang from Huachang Jewellery Co., Ltd. is the largest one in area in the world. World Record Creator: The "Riverside Scene at Qingming Festival" (part) gold inlaid with jade "wrong gold and silver" decoration created by Mr. Zhang Guowang from Huachang Jewellery Co., Ltd.
World Record Holder: The "Riverside Scene at Qingming Festival" (part) gold inlaid with jade "wrong gold and silver" decoration created by Mr. Zhang Guowang from Huachang Jewellery Co., Ltd.
World Record Field: gold inlaid with jade "wrong gold and silver" decoration. World Record Rules: 1. the world's largest gold inlaid with jade "wrong gold and silver" decoration. World Record Value: Area of 0.2817 square meters. Length 0.798 meters, width 0.353 meters. 2.2 cm thick. The "Riverside Scene at Qingming Festival" (part) gold inlaid with jade "wrong gold and silver" decoration created by Mr. Zhang Guowang from Huachang Jewellery Co., Ltd. is the largest one in area in the world. Verified on 19 November 2017.